Nick and Meg Burrows have returned to Paris for the weekend in an effort to either rekindle the romance in their 30 year marriage or dissolve the union completely. Nick, played by Jim Broadbent, is overly concerned with details and hesitant. His goal for the trip is to finally determine what tile to use in remodeling their bathroom. Meg, played by Lindsay Duncan, is bored with her life and seeking the opportunity to experience some of the finer things that Paris has to offer. Their relationship troubles come to a head when they attend a party for Nick's friend Morgan, played by Jeff Goldblum, a wealthy American writer living in Paris. 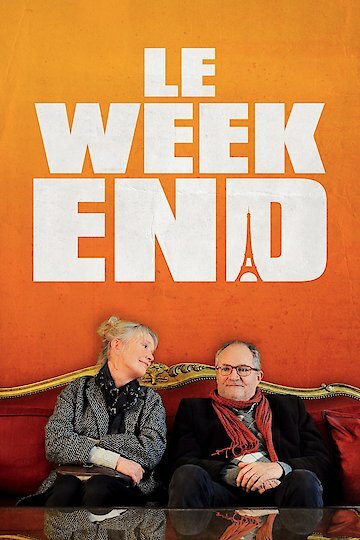 Directed by Roger Mitchell Le Week-End examines the interaction of two people who vacillate between sincere affection and genuine annoyance for one another. In their effort to determine the future of their marriage they experience both humor and heartbreak over the long weekend. Le Week-End is currently available to watch and stream, download, buy on demand at Amazon, Fandor, Vudu, Google Play, FandangoNow, iTunes, YouTube VOD online.